LANE4 recently began work on the State Line Shopping Center development project. Phase one of the project includes a new two tenant building which will house Panera Bread and Chipotle Mexican Grill. 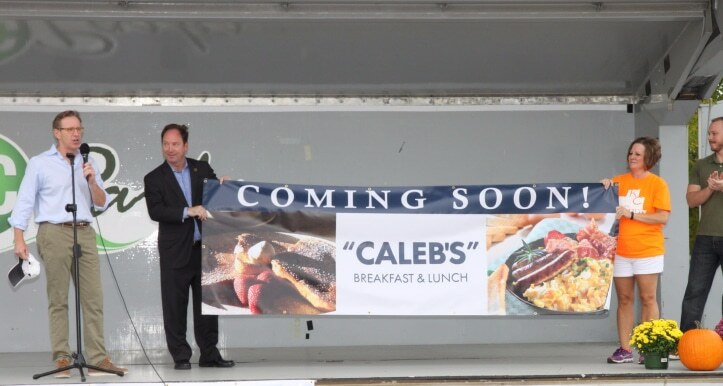 We are thrilled to welcome our newest tenant, Caleb’s Breakfast and Lunch to Red Bridge Shopping Center! Caleb’s Breakfast and Lunch is a new concept from owner Rebecca Huntsman. Rebecca is no stranger to the breakfast business, she grew up watching her father Ron Hendrix settle into a highly successful routine with a similar concept. Ron spearheaded First Watch’s expansion into Kansas City and many other areas nationwide over the past 30 years, and today owns two franchises in the Oklahoma area. The Kansas City Business Journal takes a look at the effect Amazon has had on the traditional retail market and how brick-and-mortar stores are fighting back. With quotes many Kansas City industry experts, including LANE4 President, Owen Buckley. Why did KC investors just buy up 73 percent of Prairie Village's apartment stock? Rob Roberts from the Kansas City Business Journal highlights our recent investment in the multifamily market in Prairie Village, KS. Together with Jones Development Company, LANE4 acquired a portfolio of 588 multifamily units dispersed within 5 apartment communities. This move comes as a part of a strategic effort to diversify our investment mix, taking our successful strategies forged in retail redevelopment and applying them to non-retail assets. LANE4 Property Group is pleased to announce Crows Coffee will open at Red Bridge Shopping Center in a few months. Crows is a locally owned and operated coffee shop with locations in Waldo and the South Plaza. Owner Zach Moores, a Kansas City native, developed a taste for coffee shops after his former career as an insurance adjuster left him working in cozy, local shops across the country. He says his goal is for Crows to be a community-focused and welcoming place for locals and visitors alike. Red Bridge Shopping Center is home to Integrity Martial Arts, a traditional martial arts studio combining quality training programs with character development, personal discipline and self defense for children and adults. Integrity trainer and owner’s son, David Muhammad, was recently recognized with an educational award from the Crescent Peace Society for his work with children and students both at Shawnee Mission East and Integrity Martial Arts. LANE4 is proud to partner with tenants and individuals like Mr. Muhammed, who truly make our centers and community a better place to live. LANE4 recently completed a major renovation at Red Bridge Shopping Center with a focus on creating a more safe, inviting, and family-friendly destination. Tenants like Integrity Martial Arts embody our goals for the center overall. After an incredibly successful opening two years ago, Ruby Jean’s Juicery is relocating to LANE4’s 40Broadway property in order to expand and offer additional menu items including more prepared foods this fall. From The Kansas City Star. LANE4 Property Group confirmed today demolition and construction is underway to replace the vacant and dilapidated Metcalf South Mall. Work on the project will begin immediately. The mall, located at the southeast corner of 95th and Metcalf in Overland Park, Kansas, was officially closed to the public on September 19, 2014. Demolition of the mall will begin immediately, although most of the early phases will occur on the interior of the building. Demolition will likely not be visible from the outside until mid-late May of this year. Once the mall has been razed, site work will begin to level the land and construct frontage roads. Plans are for construction to begin this fall for a store to be occupied by Lowe’s. The overall project plan also includes a number of smaller format retail buildings and restaurants, but potential tenants have yet to be announced. Locally owned and operated Tanner’s Bar and Grill has announced a new location at LANE4’s 39Rainbow project, located across the street from the KU Med campus. The casual restaurant will make a perfect addition to the line up of retail and restaurant uses at the project, ideally located to serve not only the medical community, but the surrounding neighbors and community as well. LANE4 was proud to receive a 2017 Kansas City Business Journal Capstone Award for our Red Bridge Shopping Center project.